These free scroll saw patterns can be used to create craft projects that are fun and easy to make. If you are looking for some unique gift ideas, these projects are perfect because they are one-of-a-kind gifts that you make yourself. That also makes them great homemade gift ideas. You can also use these templates to create decorations for your home or business. These patterns can be cut with a scroll saw or a jig saw. The process is simple. Download the patterns (.jpg files). Print out the pattern on your printer. Place the pattern on a flat piece of wood (or other suitable material). Use your scroll saw or jig saw to cut out the shape(s). That's all there is to it. All you need is a printer so that you can print out the images on 8.5 x 11 printer paper. You can use any thin piece of wood to create your scroll saw craft. I created a wall hanging from a piece of left-over laminated flooring from a recent flooring project. I created a trivet using some weathered cedar fence boards. The bat template is perfect for a Halloween decoration. You can cut out several of them and make a hanging mobile decoration. 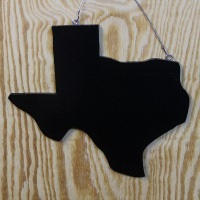 The shape of Texas template is great for making several different craft items. You can use it to make a wall hanging, or a trivet, etc. Let your imagination fly! 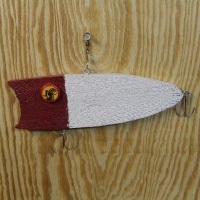 The wooden fishing lure can be used to make either a wall hanging or something to hang from your patio or to hang from the awning of your RV.